ALL THE TEAMS YOU CAN PARTICIPATE IN! The most physically active team in the Warrior Battalion, Raiders tests each cadets ability to run, pull themselves over obstacles, sprint with 40lbs, map reading, tie knots under stress, and work as a functional unit of a team. Not for the faint-hearted, the raider team rigorously trains to compete and requires more of each cadet than normal teams; the benefit, however, is a family that outweighs any vices. If you are interested in joining please contact MSG or COL and they will put you in contact with the commanders. Arrive for practice 10-15 minutes early. Rifle team is a great opportunity to learn the fundamentals of rifle marksmanship while also improving concentration and accuracy skills. They travel for county competitions throughout the school year. This includes national competitions. Aim to join the rifle team! ​ Contact c/PFC Vaden or email MSG Pick to join. Drill Team is a marching unit that performs routines based on Drill and Ceremony. They work on improving D&C skills, dicipline, and many other skills to help you be more proficient at marching and other aspects. They travel to different counties and schools to participate in competitions to see who is the most proficient at marching and to have a good time. ​ Contact c/CPT Vongpanya to join. Color Guard is the team that presents the flags at the football and basketball games. They participate in competitions where they conduct a series of marching movements. 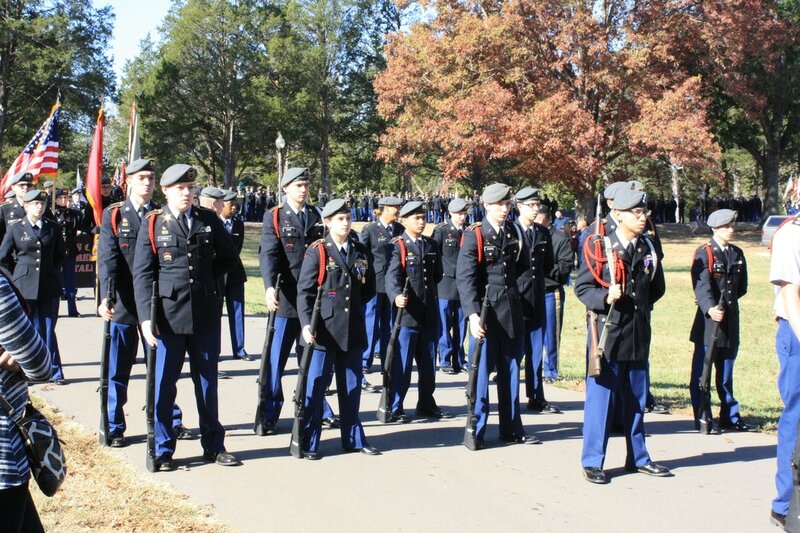 Cadets must participate in Color Guard for at least one year before being able to join the Honor Guard. Practices: 0615 on Tuesdays. After Raider season, practices will be held on Fridays. Honor Guard is one of the three teams within the Warrior Battalion that focuses on Drill and Ceremony. They perform at events of high importance including homecoming football and basketball games, the Military Ball, and presentation of VIPs. Unlike Drill Team and Color Guard, cadets must have at least one year of prior Drill experience. The JROTC Leadership and Academic Bowl or "JLAB" is a team that values acedemic improvement and scholastic excellence. They take online tests, competing with other JROTC programs all over the country. The team is split into two different teams: leadership and academic. They travel to places like Fort Knox, and this year, with the Drill Team , They will be going on a trip to compete against other JLAB teams.